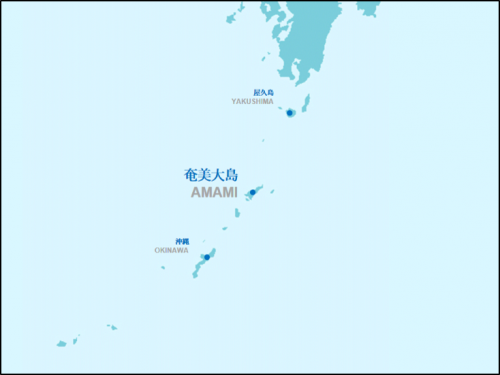 Amami Oshima is a subtropical island of Japan, halfway between Okinawa and Yakushima (an island known for its ancient forest which is designated as a natural World Heritage site since 1993.) With a population of 60 thousand, it is the largest of the Amami Islands, an archipelago currently* nominated to be inscribed on the World Heritage List. It is easily accessible, with Amami Airport boasting 44 incoming and outgoing flights a day. Amami’s unique culture and natural environment have been preserved for thousands of years. Especially prominent are the folk songs and dances, influenced by cultures of both the Ryukyu Dynasty of Okinawa and the Satsuma Domain which covered a large part of Kyushu during the Edo period (1603-1868.) It has forests rich in flora and fauna such as dark-furred Amami rabbits and is surrounded by beautiful beaches with coral reefs. Sugarcane and fruit farming are currently its major industries, while Oshima Tsumugi textile production (silk kimono fabric dyed with mud, rich in iron) used to be the key industry in the past. In spite of all its beauty based on its natural environment preserved from antiquity and its adorable culture, one thing Amami lacked was luxurious accommodations for high-end travelers.